A day in Burma – snackettes. We were still two hours from the Burmese border when our bus got stopped by the first police road block. Two armed policemen boarded our bus and did a random check of the locals’ IDs. One man and all of his belongings got dragged off of the bus for questioning. After a few minutes, he was allowed to re-board, and we were back on our way. 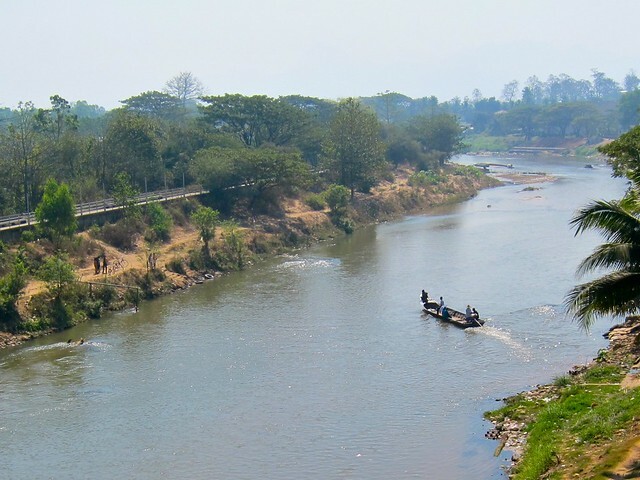 We were traveling 6 hours southwest from sophisticated, quaint Chiang Mai to the gritty little border town of Mae Sot – the gateway to Burma. We were the only foreigners on the bus. It was quickly becoming clear that our next destination was not on the usual tourist itinerary. Twenty minutes later – roadblock #2. Same drill. Except this time, the policeman wanted to see our passports. The seconds dragged on into minutes as my heart thudded in my throat and I waited for him to hand back our passports. Without saying a word, he handed them back, spun around on his heels, and we were on our way again. Despite the repeated road blocks, we eventually reached Mae Sot. We got off the bus and piled into a tuk tuk with an older American woman and got a taste of another reality of Mae Sot: the town is literally crawling with NGOs. Nearly every foreigner in town was doing some kind of work to aid Burmese refugees. Our new tuk tuk friend just happened to own an NGO in Mae Sot and was returning to check on its progress. And once we reached our hotel, we found the lobby swarming with 20’s-30’s-something foreigners discussing their progress for that day for XYZ organization with their colleagues over Skype. The next morning, we stopped at a tiny Burmese-owned restaurant for breakfast. Unlike the boiling breakfast soups that we had become accustomed to getting in Thailand, this restaurant had a few cold, pre-cooked casserole-style dishes to offer, which we’ve adopted a semi-habit of avoiding as we never really know the amount of time that dishes like these have been sitting out, unrefridgerated. We smiled at the woman lifting up the lids of each dish and tried to ask for “just coffee” as politely as we could… Unfortunately, it must have been obvious that we did want food but just didn’t want her food (in truth, we were just worried it would leave us with an new toilet encounter to document!). Assuming that we were just looking for more familiar, Western-style breakfast, she whisked herself away to the kitchen and surprised us with homemade french toast (for free!) that she brought out as we were drinking our coffee. Every day, we’re humbled by these small showings of hospitality and kindness. Standing on the side of the road, we waved down a songtaew (taxi pickup truck) that was packed with locals heading to the Burmese border. As we piled in the front seat, we looked around and realized we were the only people in the pickup truck not wearing yellow powder on our faces. Matching her blue pickup truck, our driver was dressed head to toe in a navy blue jumper, with a cakey yellow stripe swiped across her left cheek. She smiled at me as I settled in to the seat next to her, her teeth stained a dark reddish-black. We were still 1 mile from the border, and yet this… was not…Thailand. 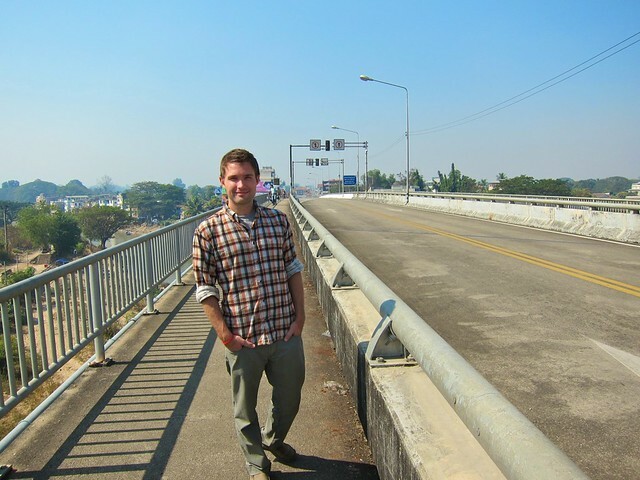 As the bridge that connects Thailand to Burma loomed in the distance, my heart thudded with nervous uncertainty. I didn’t know what Burma would be like, and I was worried about how corrupt the Burmese border guards might be. I tried to constantly remind myself that we had our passports and the correct change for the Burmese visa (500 Thai Baht– about $15 US). Suddenly, Scott and I remembered that we had forgotten to bring a photo of ourselves, an item usually required at border crossings, to be stapled to the visa application. Of course, you don’t have to have a photo if you’re willing to pay a “fee” to waive the requirement, but I didn’t want to deal with any haggling or bribing. We decided that we had gone too far to consider going back to our hotel to get them and decided to press on. 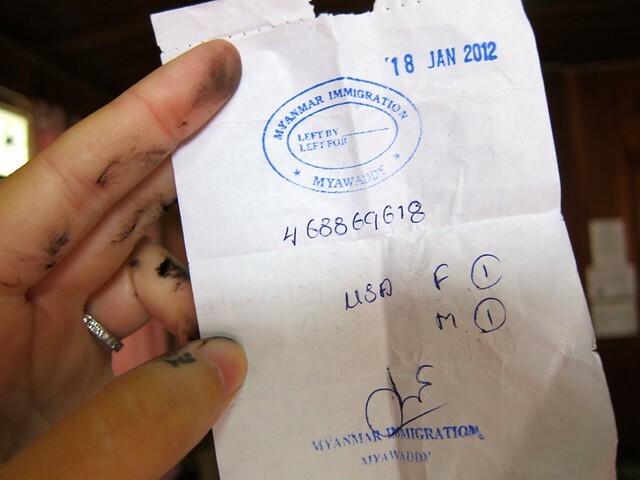 We quickly got our exit stamps from the Thai border guard, and he coached us, “You will walk over the bridge into Burma. This border closes at 5:00pm, and you must re-enter Thailand before then. When you get back here, we will give you a new 15 day visa.” Foreigners are allowed to use the Mae Sot/ Myawaddy (Burma) border crossing (even though it closed for several years during some civil unrest and re-opened again only in December, 2011), but foreigners are not allowed to go past the main town of Myawaddy, which extends only about 10 miles into Burma. Foreigners are also not allowed to stay overnight in Burma when using this border crossing, hence the 5pm deadline to be back in Thailand. The massive concrete bridge that would take us to Burma was about 1/3 of a mile long, passing over a murky brown river moving slowly below us. The sun that beat down on it was impossibly hot and blinding, and the area around us was dusty and bleak. Locals from both sides appeared to pass freely between the countries, walking over the bridge without any formalities, it seemed. Below us, Burmese people (day traders?) rowed themselves across the river in tiny wooden boats to the banks of Thailand (likely illegally) in broad daylight. “No, thanks,” we said. But he tagged right along. Hoping to ditch him (so that we would not have to pay him for walking with us), we just stopped walking and waited for him to walk on without us. He stopped too. “No, thanks,” we insisted. He grumbled “OK, OK”, and thankfully turned back to the Thai border to find someone else. 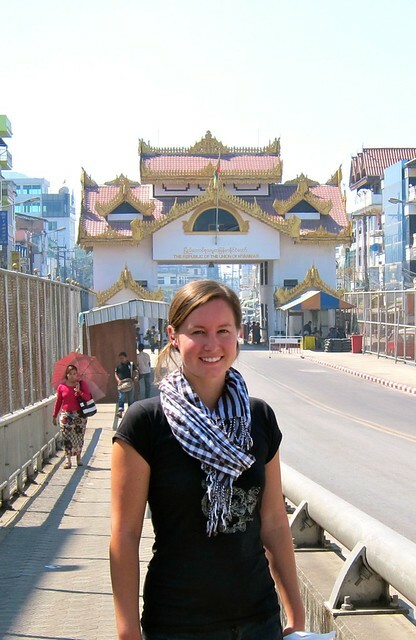 When we reached the Burmese border crossing, I could feel hundreds of eyes on us. Trying to hide my nervousness, we confidently strolled up to the tiny white cement building that said “Immigration” in Burmese, Thai, and English. But instead of filling out our Burmse immigration cards at an outside counter as we have done for other countries, we were shuttled inside the tiny building and told to sit down in two red plastic chairs. “Yep, this is the part where we get the shake-down and have our passports taken,” we thought. Instead, perhaps the nicest border guard that we have ever encountered, dressed in an all white official uniform, kindly asked us for our passports and the correct fee for the visa. He asked us if we would be returning to Thailand that day, and we assured him that we would. I kept waiting for the part where he would ask us for those headshots that we had forgotten back at the hotel and then slap us with a huge fee, but I was relieved to see that the other guard was taking the picture of our passport photos with a small webcam! No need for a headshot, after all! He then handed back our passports, stamped us into Burma, but to our disappointment, also stamped us out of Burma so that we could return to Thailand. Realizing that he thought we just wanted to do a border run and not actually enter Burma, we told him that we had wanted to walk around for a few hours inside the country. Instead of making a big deal out of it, he simply said he would hold onto our passports for us while we explored Burma, and he gave us a written receipt that we would need to show again in order to claim our passports. To be certain that we would be back at the border by 5 pm, I quickly glanced at the clocks on the wall inside the immigration building. One clock read the time for Thailand – it was 11:00 am. Next to that, one was for Burma – 30 minutes earlier. Like the bridge that had brought us here, Burma itself seemed to be in a zone entirely of its own. Feeling uneasy about leaving our passports behind, but having little other choice, we simply turned and walked… into.. Burma. The wealth of Thailand evaporated instantly. Shiny new pickup trucks were replaced with men pedaling wooden cart rickshaws. Tiny roadside shops sold similar products as Thailand – cheap cell phones, road-side SIM cards, tiny green packets of shampoo, vibrant oranges– but the market stalls they sold them in were made of termite-ridden wood, and the sidewalks they sat on were little more than crumbled concrete set into the dark red earth. The people were much darker in complexion than their Thai neighbors, more closely resembling northern Indian people than Thais. The men wore beautiful embroidered ankle-length lunghis (sarongs) instead of pants, and the thick yellow powder covered the faces of every woman and child. Many people were chewing red betel tobacco, which stained the chewer’s teeth a deep red-black and left the dirt sidewalks covered in foamy patches of thick red spit. Everyone stared at us. We were the only tourists, and some people called out “Hello! How are you?” I was shocked that there was any English spoken in this region, at all. We wandered up the main street for about a mile and spotted a beautiful temple on the other side of the road. The architecture was unlike any we had ever seen. During our meal, our host kept hovering like he wanted to talk to us. Whether he was just curious about us or just wanted to practice his English, we don’t really know. He did eventually ask us where we were from, and was excited to tell us that he liked Obama and that Obama (or Hilary Clinton, I believe he meant to say…?) was in Burma recently trying to restore relations with the Burmese government. Just as we were finishing up our snacks, an older man in a lunghi walked into the cafe and sat at the table right next to us. He then proceeded to stare at us. Didn’t order any food, didn’t break eye contact once, just stared. He didn’t even act hostile or intentionally rude; he just continued to stare out of curiosity, I suppose, for a solid 5 minutes. Even the waitress who came up to ask him what he was doing couldn’t break his gaze. He simply brushed her off and continued to stare. And just as quickly as he had come, he was gone again. We thanked our new friend for the coffee and treats, and began the walk back to Thailand. When we reached the Burmese immigration office, a new officer was on duty, and he briskly demanded our receipt in order to recover our passports from the office. I knew I didn’t have it and looked to Scott. Scott knew he didn’t have it and looked to me. We rifled through everything we owned. Smiled at the guard. More rifling, more dirty glances back and forth to each other, dreading that we would be illegally spending the night in Burma while we applied for new U.S. passports. Sensing what was happening, the guard finally said “never mind, never mind” and thankfully went to retrieve our passports, sans receipt. Passports back in hand, we began the long walk back to Thailand. On the bridge again, we passed the same tout who had tried to haggle his way into being our tour guide. 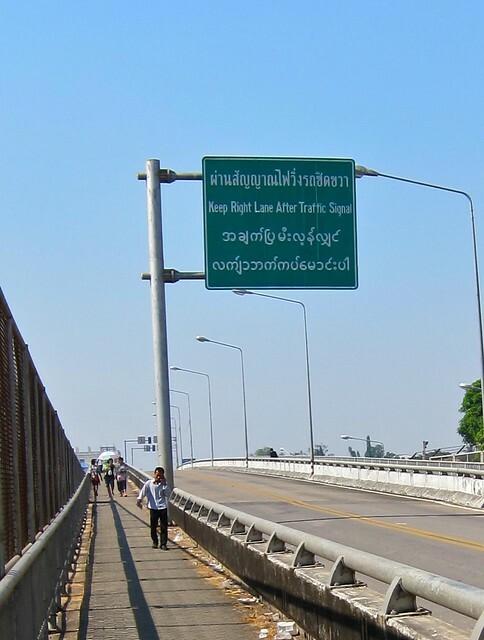 He was walking alongside another young man assuring, “The border crossing into Burma is very safe…..” As we neared the Thai side, we noticed an anti-trafficking billboard that we hadn’t noticed before– another problem in Mae Sot and Myawaddy. Leaving Burma, we were filled with more questions than we had answers.. and certainly more questions than we had before arriving. Only later did we learn that that yellow powder comes from the ground bark of a tree called the thanaka tree (common in central Burma), and it has historically been used as a form of sunscreen or general skin care product…. But who ever sees a woman’s face without the powder, and who is she keeping it beautiful for? Perhaps today it is used more for cultural identity? On our final day in Mae Sot, we met up with our friends Adam and Steph (they live in Chiang Mai, but Adam’s work for an NGO is largely based in Mae Sot). 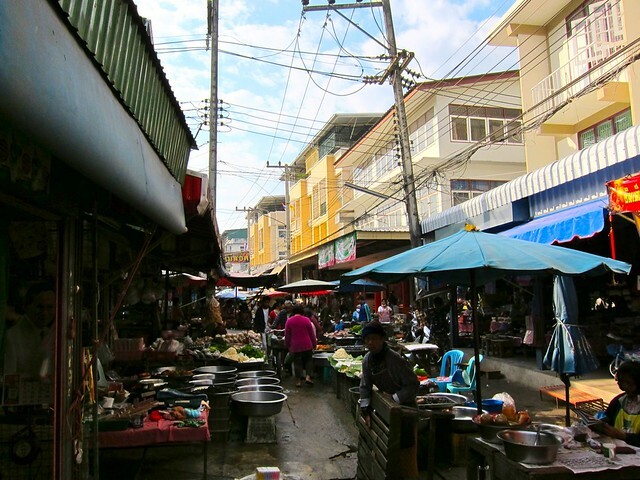 Adam divulged the harrowing details of his daily work in Burmese refugee camps and provided us with some more insight into the complexities between Thailand and Burma– places with vastly different customs, different standards of living, people seemingly living in a different time. YIKES! I was scared reading this whole post!! How ’bout we stick to typical touristy spots! MANNNNNNNNNNNNN I’m too old for this!! WHEW!